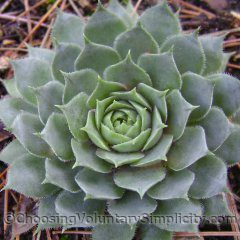 Three Sempervivum Hybrids… or Just One? 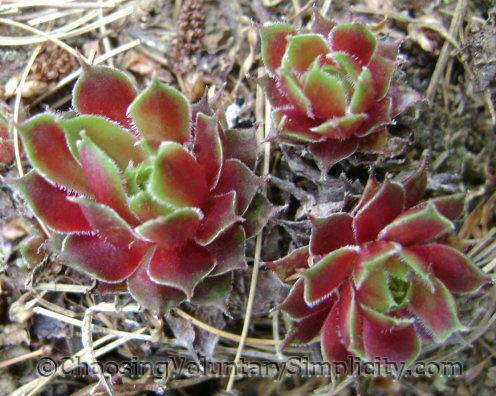 Home » Sempervivums (Hens & Chicks) » Three Sempervivum Hybrids… or Just One? Four summers ago one of my very ordinary green sempervivums produced some rather extraordinary flowers. This sempervivum was a very small rosette, but the flower clusters were unusually large… and although most of the flowers were the usual pink, a few flowers had a definite bluish-purple tone. I had just read an article about self pollinating sempervivums as a way to determine their genetic potential… apparently recessive genes can often produce quite different characteristics, and these characteristics may show up with self pollination. I really had no idea what I was doing, but I found a small brush and spent some time transferring the pollen from the pink flowers onto the stigmas and the centers of the purple flowers. I used the same brush (which maybe wasn’t the best idea) and transferred pollen from the purple flowers to the stigmas of the pink flowers. The next morning I repeated the process with all the flowers because supposedly the stigmas may be more receptive to the pollen on the second day. I covered all the flowers with small paper bags so the bees wouldn’t do their thing and waited… hopefully… for the seed heads to form. Several seed heads actually did form… not as many seed heads as there had been flowers, but still enough to be encouraging. I brought the seed heads inside and stored them in their little paper bags until they were completely dry. By this time it was winter and too late for any seed planting outside, so I kept the seeds in the paper bags in the refrigerator until spring. Refrigerating (but not freezing) the seeds supposedly increases germination rates. The next spring I planted all the seeds in two large pots that I sunk in the ground. Sempervivum seeds are incredibly tiny and I wanted to keep any potential plants in a confined area. The first year wasn’t terribly inspiring. The germination rate was disappointing… only a few seedlings in each of the two pots. The plants were very tiny and grew very slowly. Most of the seedlings didn’t make it through the subsequent winters. This past spring the count was down to only three seedlings in one of the pots, but the main difference was that this year all three of these seedlings actually looked like healthy little plants. There was another difference this year too… the three previously all-green baby sempervivums were now showing lots of bright red coloration that lasted through most of this past summer. The shape of the leaves is almost identical to the parent plant, but the baby sempervivums are very different colors. So do I have three hybrids… or just one? Obviously the new seedlings came from the seeds I planted, but I wouldn’t expect all three seedlings to look alike if they came from different seeds. I think it’s more probable that only one seedling actually survived and after four years of growth had a substantial enough root to produce all three of this year’s rosettes. I had a sempervivum that had 2 colors of flowers. I wish I had done this. Very interesting. I will be experimenting with this idea the next time I see flowers. 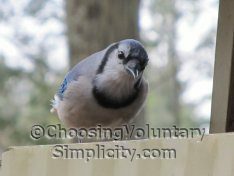 I didn’t realize the process would be so easy or so doable. Thanks for the explanation. Nice looking semps. I hope you will keep us updated with their progress and any changes as they mature. I think you have one hybrid root that produced 3 rosettes because like you I don’t think 3 separate ones would look so identical. Nice post. i fully suggest you set aside a place for them to do it naturally too i have a coldframe where i put some take some away and some of the new plants i have found after a few years are amazing. adds a new level to an already great love.